Sun and Moon daily events anywhere around the world with Live Tile showing your local time on 24 hour clock with sunrise and sunset times. 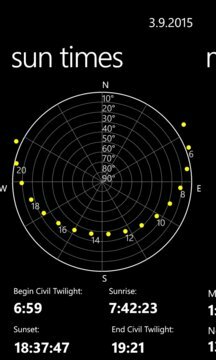 Local Times calculates sunrise, sunset and civil twilight times and the path of the Sun throughout the day for your current position or any selected location. Moon info will tell you the moon phase, moonrise and moonset times as well as dates for the next new moon and full moon. You can also set a different date to see how times change throughout the year. 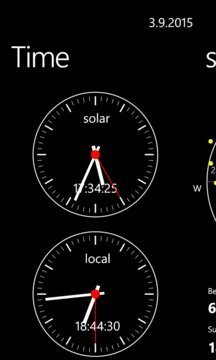 Premium version with Moon times on Live Tile and additional view with Sun and Moon positions.